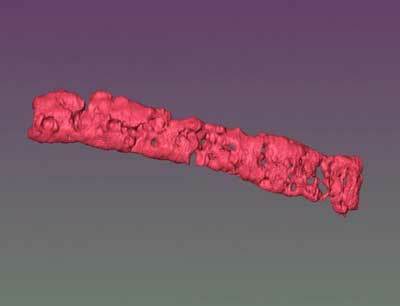 (Nanowerk News) Micropores in fabricated tissues such as bone and cartilage allow nutrient and oxygen diffusion into the core, and this novel approach may eventually allow lab-grown tissue to contain blood vessels, according to a team of Penn State researchers. The researchers are trying a novel approach and creating tissue building blocks with micropores. They consider this an alternative to vascularization -- growing blood vessels in the tissue -- and call the outcome porous tissue strands. The researchers are starting with stem cells derived from human fat and mixing them with sodium alginate porogens. Derived from seaweed, sodium alginate can be printed into tiny particles that, when dissolved, leave behind tiny holes -- pores -- in the fabric of the tissue. The team uses the mixture to 3D print strands of undifferentiated tissue. They can then combine the strands to form patches of tissue. When the researchers expose the tissue to the chemical cocktail, it turns the stem cells into specific cells, in this case bone or cartilage. Because of the pores, the fluid can flow to all of the stem cells. The researchers report in a recent issue of Biofabrication ("Porous tissue strands: avascular building blocks for scalable tissue fabrication") that the strands maintain 25 percent porosity and have pore connectivity of 85 percent for at least three weeks. By 3D printing strands next to and atop each other as shown in their previous work, the strands self-assemble to form patches of tissue. The researchers are considering applying the same methods to muscle, fat and various other tissues.